Wrong way down a one-way track. Little Nightmares' third and final DLC pack, The Residence, is now available. 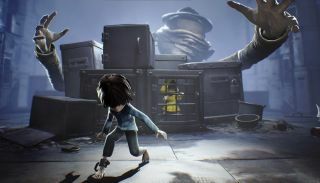 In the first two DLC chapters, the Runaway Kid (no, not Six—these stories occur in parallel to Six's own sad story, so some fans call him Seven) successfully eluded the wrath of the Granny and learned about the history of the Nomes. Now, The Residence sees the Kid pitted against the mysterious Lady, along with some new, nightmare-fuel enemies. As like the other instalments, The Residence tasks you with eluding some hideously evil traps and puzzles with just a flashlight and your own quick thinking. "Finally, the last part of the puzzle is here!" says publisher, Bandai Namco. "This final chapter will close the story of The Maw by shedding light on the last secrets of the adventure. All remaining questions from the game will be answered in the conclusion of the Season Pass!" Little Nightmares is available now on PC (via Steam and GOG) and PlayStation 4, and Xbox One. In our Little Nightmares review, we gave it 78, stating: "An okay platformer but a deeply imaginative horror game, Little Nightmares is worth playing for its array of disturbing imagery."